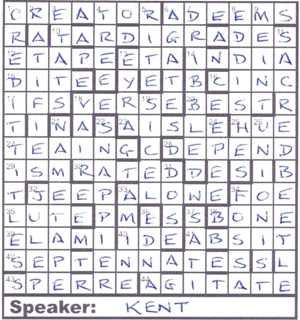 Here, we had 32 clues with an extra wordplay letter, and 19 with an extra word. Well — they should be easy to disentangle! It was nice to be told how many of each; so often we’re just told it’s “some” or “most”. I don’t mind telling you that it actually didn’t make it any easier for me to do the disentangling. But I get ahead of myself. Has Chalicea confirmed her membership of the Zealous Enthusiasts Drinking the Sauce? Well, of course she has — by its omission! Yet again she has gone out of her way to appear abstemious, here by omitting obvious Z-words like BOOZER, SOZZLED and SWIZZLED, as well as SHIRAZ, SLIVOVITZ and ZINFANDEL (which could become Shiraq, Slivovita and Finfandel, places in Eastern Europe, familiar to Listener solvers). See you at the bar in York, Chalicea. In fact, this turned out to be one of Chalicea’s more tricky oeuvres. I was somewhat disappointed very early on that TARDIGRADES didn’t have any reference to Dr Who‘s Tardis! However, she compensated for that omission with 1dn List Director etc, etc in order? These might do that (12, two words), an excellent &lit clue to CREDIT TITLES — (LIST + DIR + ETC + ET[c])*. Bizarrely, I never knew that that was the full expression for credits. It wasn’t too far into the solve that a few Zs in the top and bottom left gave the game away. Moreover, this enabled me to guess that they would all appear in the grid in the shape of a giant letter Z. A bit more work was required to jog my memory about the letter zed in Shakespeare’s King Lear: “Thou whoreson zed, thou unnecessary letter!” I’m not sure that feeling is supported by American English where they seem to use it wherever possible. And those extra words? Well they all had to slot into the grid so that the zed words became something else. DITZ became DITE, ZINC became C-IN-C and SNAZZIER became SNAPPIER. Very entertaining. This entry was posted on 23 November 2018 at 4:00 pm	and is filed under Solving Blogs. Tagged: Chalicea, Offender. You can follow any responses to this entry through the RSS 2.0 feed. You can leave a response, or trackback from your own site.